‘And forever starts now…’ wrote Priyanka when the couple finally posted their much-awaited pictures from their extravagant and royal indo-western wedding from the Umaid Bhawan Palace, Rajasthan. But due to the social media lock-down we could not see a much from the wedding. The wedding, which followed after the fun-filled and intricate Mehendi, haldi and sangeet ceremony saw the couple yet again striking the eyes with their attire and this time both looked ravishing in custom Ralph Lauren outfits for their Christian wedding. Even the bridesmaids and groomsmen donned the American designer’s ensembles. Priyanka and Nick were married in a ceremony officiated by Nick’s father, Paul Kevin Jonas Sr. around 4:30 PM and the couple exchanged wedding bands by celebrated jeweller Chopard on Saturday. 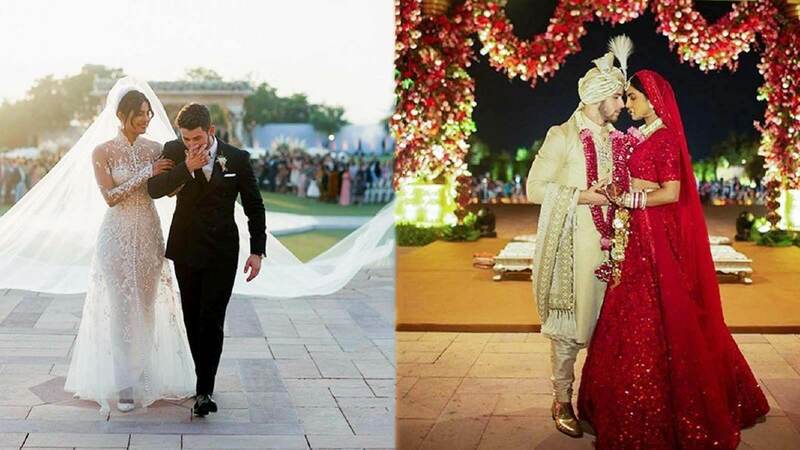 Just after the wedding pictures were made public, Priyanka Chopra’s 75-foot-veil and the 18 feet high wedding-cake, for which Nick flew in chefs from countries like Dubai, became the talk of the town. ‘The emotions were running high during the ceremonies, I think especially during the western wedding for me. You know you think your whole life about that moment. Honestly, I could not have imagined it would be as perfect as it was. It was highly emotional,’ quoted Nick. ‘I could not hold it in. I think I was nervous and scared. But as soon as the curtains opened, and I saw his face it was just like everything settled and I knew I was making the best decision of my life,’ the Quantico star revealed. A second wedding ceremony, in accordance with Hindu traditions, took place on Sunday at the same venue after a traditional ‘chooda’ and ‘haldi’ ceremony. The bride and groom were dressed by the very own, India’s biggest designer Sabyasachi. The bride was in a sparkling, crimson red lehenga made of hand-cut organza flowers, French knots in silk floss, and Siam-red crystals. It took 110 embroiderers in Calcutta and 3,720 hours to create this insanely intricate look. As a tribute to the Mughal jewellery, she wore uncut diamonds, emeralds, and Japanese cultured pearls set in 22-karat gold by Chopard. As for the groom, wore a hand-quilted silk sherwani, a hand-embroidered chikan dupatta, and chanderi tissue safa. His jewels included a rose cut kalgi and syndicate diamond necklace by Sabyasachi. ‘I always knew I wanted a red traditional silhouette for my wedding but Sabya brought in incredible French embroidery to the mix and with incredible jewellery and Western-inspired veil it was just such an amalgamation of who I am,’ admits the bride. Post the wedding the newlywed couple stepped out glamorously, where Priyanka wore a green and gold saree by Sabyasachi, with the chooda in hand and sindoor in the park of her hair.